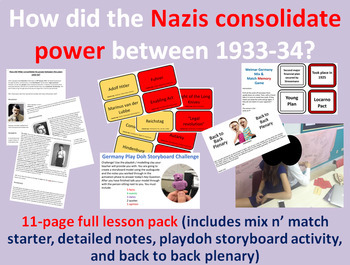 In this lesson students explore how Hitler consolidate power between 1933-34. The class begin with a mix and match starter to test subject knowledge before working their way through the notes. They then complete a playdoh storyboard to consolidate their learning (this can be done as a simply drawn storyboard if the teacher prefers). The lesson finishes with a back to back plenary in which students are awarded points for guessing their partners key words (there are given words they are not allowed to use). In this lesson students explore a high level of content in an engaging and active manner designed to embed subject knowledge in long-term memory.